The American Samoa Community College (ASCC) course Business Communication (BUS 160) is designed to provide the knowledge and skills needed for effective communication to achieve personal and business goals. One highly valuable skill in today’s business climate is the ability to communicate with a diverse and global workforce. With globalization now a primary aspect of modern commerce, the ability to understand and appreciate the unique histories and cultures of other countries gives young entrepreneurs a marked advantage in their interaction with the international business community. 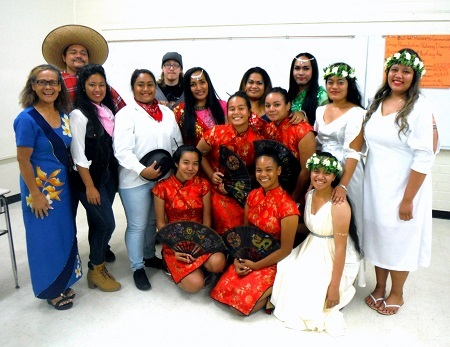 Earlier this week, the Business Communication students at ASCC, under the guidance of instructor Dr. Faofua Faatoafe, showcased their understanding of other cultures with their Celebrating Diversity presentation. Before an invited audience, the class divided into teams of four to give presentations on global trade partners Mexico, India, China and Greece. Each team’s presentation included an overview of each respective country’s history and culture, followed by an analysis of their economy and profile in today’s business world. To give an idea of each country’s cultural spirit, the teams also dressed in outfits typical of their nation of focus, performed a traditional or modern dance representing the country, and contributed a dish associated with the country to the luncheon following the presentation. BUS 160 instructor Dr. Faatoafe explained that the main goal of the student presentations was not only to demonstrate different ways to to illustrate diversity in the workplace but also to do so in a way consistent with many of the Student Learning Outcomes, Program Learning Outcomes and Institutional Learning Outcomes as outlined in the BUS 160 Course Syllabus-Topical Outline. Each presentation was assessed based on rubrics involving, first, Group Presentation, and second, Business Professionalism Contribution and Image. A number of ASCC faculty and staff from outside the Business Department were invited to attend the presentation as guests. The participating students were Elizabeth Leo, Mary Jane Iosefo, Malu Maui'a, and Lusia Vaaiga in the team presenting on Greece; Margaret Ueligitone Hall, Lynette Lagai-Sese, Teriana Lavatai, and Agnes Aneki presenting on China; Aaron Hall, Mt. Carmel Vaueli, and Babe-Sarah Tumui presenting on Mexico; and Oina Leo, Riri Lili'o, Matthew Fatuesi, and Toenuti Konelio presenting on India.